I receive emails every day from anglers looking for advice on how to catch bonefish on those days when they are not with a guide. I’ve been bonefishing for twenty years and like most of us, spent the first five years fishing exclusively with guides. I thought I was getting pretty good and put my bonefish I.Q. at around 120. So, I tried it on my own, only to find out that it was actually my guide who was smart and my bonefish I.Q. was more like 35. So game on, challenge accepted, and I have spent the last fifteen years learning everything I could about how to DIY for bonefish. There is a lot to learn to be successful on your own. After all, now you have to know where the fish are, how they react to tides, what they eat, see them before they see you and make a presentation that won’t send them into deep water. There is no boat to run you out three miles, instead a car, bicycle or kayak is your chariot to the flats. Nothing replaces time on the water and most of the early lessons are going to result in fishless days, but let me see if I can ease the pain and help shorten the learning curve with some basic strategies for the DIY fisherman. Instead of spending those hours at home dreaming about your upcoming trip, spend that time scouring satellite images to find places others might not easily discover. 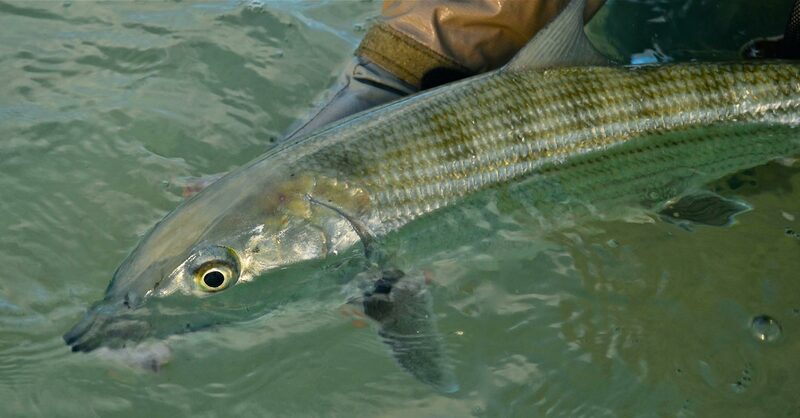 The hardest bonefish in the world to catch are those that have been trained by the few hundred anglers before you. 2. The DIY Fly Box is different then the Guide Fly Box. You are almost always fishing very shallow water, the fish are generally close in and more than likely this is not their first rodeo. Go smaller (#6 as average), lighter, less flash with plenty of moving parts. 3. Fish as long a leader as you can cast. I make my own leaders so they are stiffer and turn over better on short casts into the wind. The last four feet should be fluorocarbon and use the smallest diameter tippet you can get away with. 4. Line management is important. After getting my line tangled in my feet for the 380th time, I no longer trail long loops behind me. My set up is 15 – 20 feet out the tip, trail ten feet behind me and take the extra four seconds to strip off whatever else I need. DIY presentations are normally fifty feet or less. 5. For “spooky” fish, use a long leader, small fly, cast well in front and let the fly sit. When they get close to the fly, start your strip. If they spook even then, (think Airport Flats, Cherokee Sound, Governor’s Harbour, Savannah Sound) then you have to get creative. Normal bonefish flies won’t work on pressured fish. They have seen every “Charlie” ever made, so tie on something unique. 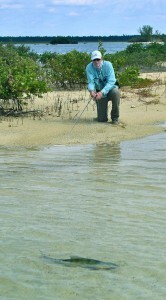 If they are still fleeing when you move the fly, try the bonefish “no-strip.” It takes some getting use to, but works. Use a fly made from materials that wiggle like rabbit, marabou or rubber legs and just let it sit on the bottom. Don’t strip; let the current provide the action. The trick is to watch the bonefish as they pass over your fly and look for that little “dip” of their head signifying they have picked up the fly. Not stripping is harder than putting back a Snickers bar on Halloween. There is nothing I like more than casting to tailing fish at twilight, but man can they be frustrating. They’ve got their nose down and are intent on finding prey in very shallow water. So when I find some tough ones I use my “dry fly bonefish technique.” Long, light leader, size #8 un-weighted fly (something like a Flea) and delicately drop it right on their head. You don’t spook them with a “plop”, no guessing which way they are moving and often they are just surprised to see a food item right on their nose. Doesn’t seem like this should come into play but walking quietly is key. I’ve found that conventional flats boots are too heavy and noisy. When I’m on sand flats that I know presents little danger I wear much lighter neoprene hard bottomed kayak boots. Long soccer socks or their equivalent folded over the top of the boot and I am good to go. You are not doing anything wrong. 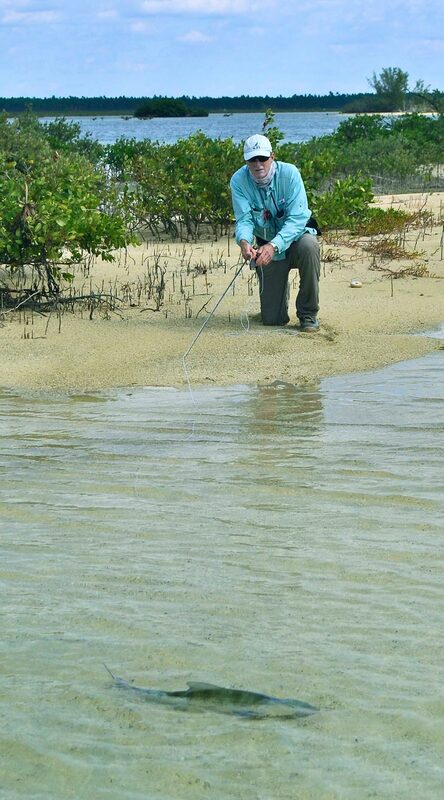 It just takes time, patience and an appreciation for how lucky we are to be wading where bonefish live with a fly rod in hand. Rod Hamilton has been an avid fly fisher for over forty years chasing salmon, trout and steelhead from his home base in British Columbia, Canada during the summer and flats species in the tropics during the winter. 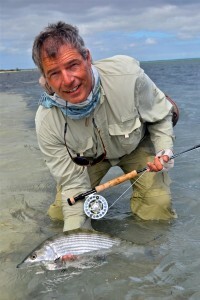 Through his recently published book Do It Yourself Bonefishing and blog www.diybonefishing.com he shares his passion for catching bonefish on the fly with like-minded fishermen from around the world. In addition to the book and his online outlets he writes for a variety of magazines and is currently working on his next book, Bonefishing: Off The Beaten Flat. 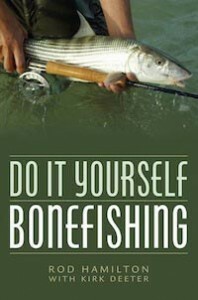 Rod’s new book “Do It Yourself Bonefishing” is spectacular! You can read a review HERE. 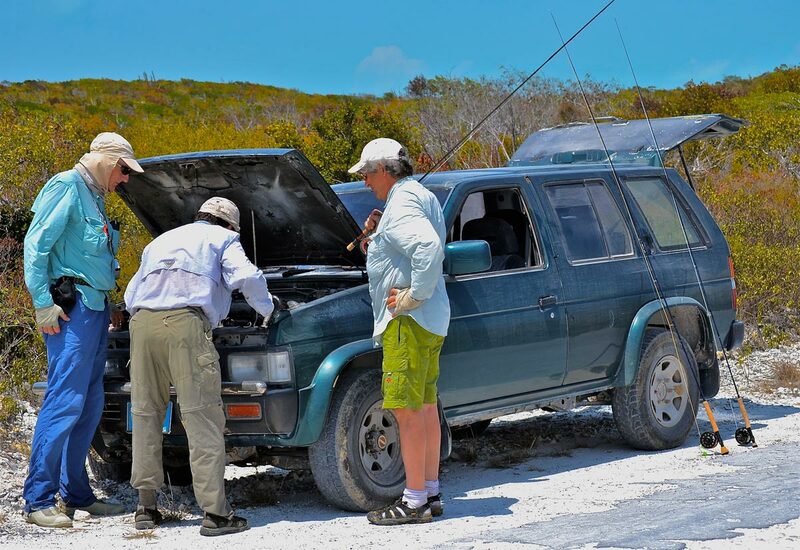 This entry was posted in Fly Fishing Tips & Technique, Saltwater Fly Fishing, The Hot Ticket and tagged bahamas bonefish, bonefish, budget bonefish, DIY bonefish, fishing, Fly Fishing, fly fishing lessons, Fly Fishing Photography, Gink and Gasoline, how to fly fish, Kent Klewein, learn to fly fish, Louis Cahill, permit, photography, rod hamilton, salt water fly fishing, tarpon by Louis Cahill. Bookmark the permalink. Thank you for these excellent strategies. Last summer I had a chance to do some DIY bonefishing in Hawaii after spending a day with a local guide. The most important part was learning how to see the bonefish on the Hawaiian reef before it got to close or I spooked it. Your strategy of using Google Earth is spot on; I was able to identify spots on the reef near where I was staying where bonefish would most likely be by using this app on my iPhone the night before and marking the spots. 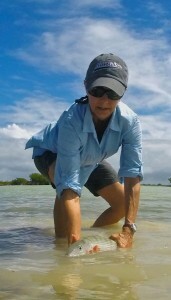 For line management, I had brought my casting basket as the area I was fishing was on a rocky/coral covered reef with sand channels that the bonefish used, so preventing line tangles around my feet and reef was critical. The most interesting item I learned from the guide was to identify other fish that the Hawaiian bonefish follow or shadow. My biggest hookup came from a bonefish that was about 10 yards from a school of Convict Tangs feeding on algae; the tang would stir up crustaceans and other small animals as they picked at the algae and the bonefish was feeding on these animals. So I kept my eyes open for these schooling fish and scanned the area around them for bonefish. Thank you, Rod. That is excellent, pragmatic advice!